Here is an interesting edit of a dramatic number entitled “Nightmare”. The ladies’ costumes are all in black, white and gray tones, so it was natural to emphasize the contrast and render the image in black and white. Even though I pushed the contrast, I did soften the image a bit to create an organic look. This is another example of dramatic edits that can come from high-key lighting and creative posing and post-processing. Last weekend I had the honor of taking dance portraits at Jamie’s School of the Dance in Warren, PA. Jamie has two studios in Warren County and we worked with students from both schools. We chose an interesting backdrop with earthy colors. The costumes were very unique. Some of them were delicate ballet or lyrical designs, and others were more modern or abstract. This young dancer wore a very interesting black and blue unitard. We posed her this way to capture the pattern and color of the blue against the black. Some high-contrast front lighting and a tight back highlight increases the dramatic impression of this image. Some artistic post-processing finishes the effect. 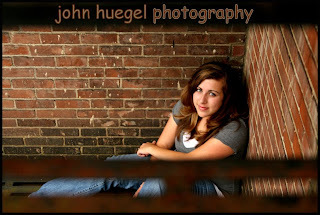 This image of Erin was created recently in downtown Warren, Pennsylvania. Erin was fond of this theater and captured some great images around the fire escape and other settings of this great historic building. For this image, Erin sat against the two outside walls and I shot down through an opening in the steel fire escape stairs. The top border where the text is printed is actually the upper stair, and you can see the bottom stair as well, out of focus at the lower part of the frame. This image has great lines, converging at a “rule of thirds” intersection at Erin’s eyes. There were no light modifiers used – this is pure daylight on an overcast day. Erin did an excellent job of researching her choice of photographers and settings. Her hit list of sites was well thought out and made for some great creative shooting. I encourage all seniors to research potential photographers, and also to think about places they would like to use for their senior images. They mean so much more to a senior than some abstract background in a studio camera room.